The Lantern Parade, which started as a fund-raising event for The Vanishing Elephant, has now been taken to the town’s heart and involves hundreds of people each year. 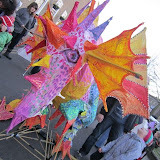 The 2013 Parade took place in the evening of Saturday 16 February and went from outside the Library down Monson Road and Camden Road, finishing at St Barnabas School for food and entertainment. Bloco Fogo, with a band of around 40 people headed the procession helping to raise the excitement levels, with people dancing in the street as we went. "I just wanted to say a big thank you to everyone who contributed to making last nights Lantern Parade another fabulous event, many people I spoke to at the end last night spoke about the emotional effect of the Parade. Everybody be it participants, stewards, performers, financial supporters, local councils, police, businesses, all of you come together to make this event what it is. It is difficult to pinpoint what makes this parade so successful but successful it is and with everybody's continued support it will continue to grow and draw more people in from across the town." Celebrating Chinese New year on the 25th February due to the earlier postponement of the event due to cold weather and health and safety concerns. We formed up with a band of nearly 40 drummers at about 5:15 and had a quick warm up by playing Calypso in front of the gathering crowd and impressive lanterns lined up at the start. Bloco Fogo led the parade with our flag bearers, setting off from front of the Museum & Library on Civic Way at 5.30pm walking along Monson Road, Camden Road and finishing at about 6.30pm at St Barnabas School, Quarry Road where the Friends of St Barnabas School were selling refreshments in the playground. Finishing with Bave and a confetti cannon, which seemed to hang in the air for ages due to the lack of wind. then some audience participation with some alternate cheering and drumming. What a great event, we always love this one. As always a few photos and a link to some more. The Chinese new year will be celebrated in style in Tunbridge Wells with hundreds of young people invited to take part in a winter lantern parade on Saturday 5 February. The parade celebrates the Chinese custom of making brightly coloured paper lanterns and is fast becoming an annual custom in Tunbridge Wells. This year the lanterns will have an underwater theme. The parade will leave from outside the Museum and Library on Civic Way at 5.30pm. Bloco Fogo Samba band will lead the way as the procession heads down Monson Road and Camden Road to St Barnabas School, where refreshments will be available. The parade is the culmination of a day of events including family fun at Tunbridge Wells Museum and Library and the chance to ‘make-a-shaker’ at the Trinity. The shakers will help everyone taking part in the parade keep to the samba rhythm! The event has been organised by the Tunbridge Wells Arts Partnership, which includes Kent County Council, Trinity, Town & Country Foundation and Tunbridge Wells Borough Council. Dawn Grant. Town & Country’s community development manager, said: “The lantern parade has become a regular winter event in Tunbridge Wells and it’s a wonderfully exciting, colourful and lively occasion for the children who take part. Free workshops are being held so that children can make their own underwater-themed lanterns – anything from an octopus to a shark – with materials and expert guidance available. These take place at TN2, Sherwood, on Saturday 15 January; St Barnabas School on Saturday 22 and Sunday 23 January; and Southborough Primary School on Saturday 29 January.